A provocative installation in Sweden about female genital circumcision has been labeled sexist and racist after the country’s culture minister actively participated in the provocative mock-mutilation show. ­Artist Makode Linde presented his mind-blowing “Painful Cake” installation for World Art Day at Stockholm’s Moderna Muséet on April 15. 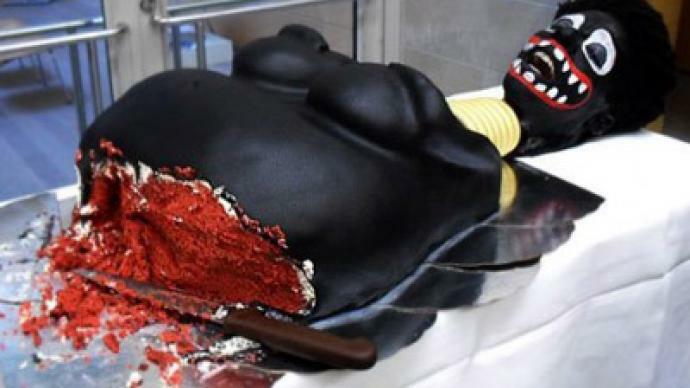 The cake was made in the caricatured form of a naked torso of an African tribal woman with the live, make-up-covered head of the Afro-European artist attached to it. Makode Linde was hiding his body within the serving table. To make the process correspond to genital mutilation, the installation was cut starting from the nether-regions, revealing the blood-colored interior of the red velvet cake. To make the allegory even more convincing, the artist screamed in pain every time a visitor cut a slice of the brown body on to his or her plate. Makode Linde could be celebrating true success of the installation by publishing photos and videos of the event in his Facebook account, but the appearance of Sweden’s Culture Minister at the installation created a scandal with a racist twist. Lena Adelsohn Liljeroth poured more fuel on to the fire of controversy by a sticking a knife into the macabre chocolate body to claim a wedge, sparking outrage in Sweden. Sweden’s National Afro-Swedish Association rushed to stigmatize the event as “a racist spectacle,” informed Swedish newspaper The Local. The Association demanded Liljeroth’s resignation for taking part in the performance. The minister dismissed the suggestions, reminding that true art must be heartfelt.